DESCRIPTION: This new addition to the publisher’s fine range of aviation titles has received the Haynes Workshop Manual treatment. A lavishly illustrated work, this book features full colour throughout and some excellent sketches and drawings. Happily the interesting subject is still represented by a handful of aircraft that have been restored to flying condition and work the air show circuits. The author may be unknown to aviation enthusiasts, but has excellent credentials as a wordsmith. He worked for the RNLI for 28 years and is remembered for his work in presenting the world’s foremost lifeboat service as the RNLI Director of Public Relations. On retiring from the RNLI he has written some excellent books on lifeboats and branched out into writing about WWII intelligence operations. His family includes Admiral Wake-Walker who was Senior Naval Officer at Dunkirk who transferred his Flag to MTB102 when his destroyer was sunk under him. MTB102 was the Vosper prototype for the hundreds of gunboats and torpedo boats built during WWII by Vospers. At the time, the skipper of MTB102 was still working on the tactical manuals for Coastal Forces and went across to Dunkirk to see what he could do to help. MTB102 was one of the last vessels to leave Dunkirk, having survived many attacks by German aircraft, including a 500kg bomb dropped by a dive bomber, exploding within three feet of the transom. The subject of this new Workshop Manual is an extraordinary aircraft from an unusual aircraft manufacturer. Westland became famous as a helicopter builder when it began building Sikorski designs under licence and improving on the designs, before beginning to design its own helicopters. Today it is a very important helicopter builder, now as Agusta Westland, a division of the Italian defence contractor Finmeccanica. In 1896, J B Petter & Sons was established in Yeovil as an agricultural engineering company and it soon established a reputation for the quality and durability of its products. Petter engines are still being used on restored vehicles and its ability to provide foundry products and steel-work made it an obvious recipient of Government contracts during WWI. Westland Aircraft was established as a division of J B Petter & Sons and was soon building aircraft to Short Brothers and Sopwith design for the Admiralty. There was an interesting and important difference between the Army’s Royal Flying Corps and the Royal Naval Air Service. Initially, the Army led in aviation. RN gunners borrowed Army hydrogen balloons in South Africa as gun directory platforms in the conflict with the Boers. In 1903, the RN carried out extensive trials with man carrying kites designed, at the Army’s balloon factory in Farnborough, by the showman Cody. However, the RN focussed on the Cody motor kite which in 1908 became the first British built aeroplane to fly under the power of a combustion engine. In 1911 the RN established its own flying school and the first RN officers to train were then given responsibility for working out how best to weaponize aircraft and use them to support the Fleet in its duties. This rapidly took them ahead of the Army. The battle for control of aviation began with the naval aviators being placed within the RFC under Army/War Office control but the RN managed to take back control of naval aviation a month before the outbreak of WWI and promptly celebrated by dropping a torpedo from one of its early aircraft. The result of this was that the Army entered WWI with uninspiring products from the Government Aircraft Factory, whilst the RNAS turned to proven naval contractors who built as commercial companies. From this, the RNAS entered WWI with aircraft designed to meet their requirements as integrated weapons systems. The Army saw its aircraft as scouts or airborne light cavalry, making notes and taking photographs of enemy troops and carrying that information back to the commanders. They were also tasked with gunnery direction, but tethered balloons, connected to field telephone networks, provided a better early information and gunnery control service. Against this, the RNAS was already dropping bombs on German installations, developing the theory of strategic and tactical bombing, and destroying German airships. RNAS torpedo planes were soon in action and achieved their first successes against the Turks, including one memorable example of an RNAS floatplane still taxiing in the sea and sinking a Turkish vessel with a torpedo. It took the Army some time to catch up and develop fighter and bomber squadrons. It also took the Government Aircraft Factory even longer to catch up with commercial aircraft builders, with the impressive SE5, but much of the Army success in aviation was achieved by copying the RNAS in buying from commercial suppliers, particularly the superlative Sopwith aircraft. WWI provided the lessons of using aircraft to support land forces and this came to mean army co-operation aircraft, with the newly formed RAF seeing its primary role in carrying on with the RNAS strategic bombing concept and providing point defence fighters to protect Britain against enemy strategic bombing. Maritime patrol and army co-operation received secondary attention from the RAF which may explain how the Westland Lysander came to be built and how the British fell behind in army co-operation. Into WWII, the RAF idea of army co-operation was slow poorly armed aircraft that could operate close to the front line from small primitive grass strips. It was on that basis that the procurement specifications were drafted, against which only the Westland Lysander and the Bristol 148 competed. Westland was considered a suitable supplier mainly on the knowledge of the Westland Pterodactyl, which was an ugly tailess design that actually performed remarkably well, particularly in short field operation. A parasol monoplane with canvas covering and fixed undercarriage, the Lysander was perhaps a better looking aircraft than the Pterodactyl, but it was no beauty, having a very tubby fuselage, heavy spatted main wheels and a blunt radial engine. The pilot was given a high seat under an extensive glazed cockpit, with a gunner/observer/radio operator seated behind and facing aft with a flexible mounting for a single or twin Vickers K gun as defensive armament. Offensive armament was restricted to a rifle calibre fixed machine gun in each wheel spat and small wing-like extensions to each spat to carry up to six very small bombs on each side. That was the full extent of its ability to look after itself and act offensively. The result was that the Lysander could do very little beyond providing a vulnerable slow aerial observation post. Those Lysanders taken to France with the BEF were easy meat for enemy fighters and totally outclassed as military aircraft. Against them, and in the army co-operation role, the Germans used Ju87 dive bombers as aerial artillery and Me109 fighters. On the Eastern Front towards the end of WWII, Ju87 and FW 190 aircraft were used as aerial artillery and anti-tank guns, destroying large numbers of Russian tanks and often taking off to bomb tanks on the edge of the airfield. The tank ace, Col Rudel, was credited with killing more than 1,000 Russian tanks and his real kill rate was far higher because when Hitler ordered him not to fly anymore, he continued to fly and just credited his kills to new pilots in his group. It could therefore be argued that, in no fault of Westland, the Lysander was useless and could be consigned the dustbin of aviation history, and yet the aircraft was to perform a completely new role outstandingly, with an impact on the progress of the war to rival the famous aircraft, the Spitfires, Hurricanes and Lancasters. This role was in covert support of intelligence operations and resistance groups. The author has made an excellent job of telling the story of the Lysander, what led to its design and how it came to perform a most valuable war service far beyond any reasonable expectations and its original specifications. The Lysander did serve in the Middle East and Burma in a more traditional army co-operation role and for special operations. It also served in the air-sea rescue role from England and Canada, but it was its clandestine night flights in and out of tiny French fields, delivering and recovering agents, evaders, and bringing in specialist supplies to support agents and resistance fighters. The author has made as his focus the splendid restoration of V9367 as a Special Duties RAF No 161 Squadron aircraft. This aircraft is part of the outstanding Shuttleworth Collection of vintage aircraft. This aircraft has provided some great photographs and technical detail that fully justifies the Owner’s Workshop Manual title, providing an account of what makes up the aircraft, how it is maintained and flown. 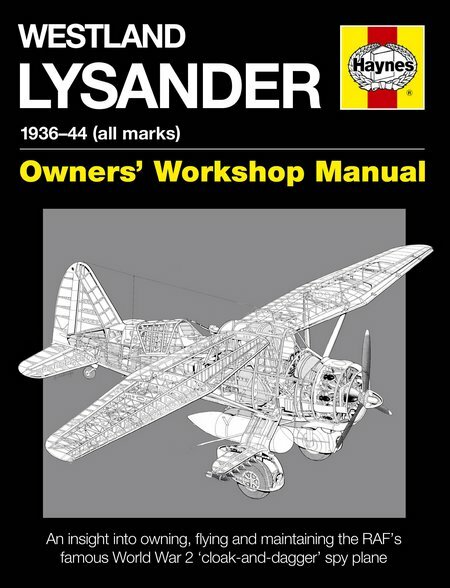 There is also information of other Lysanders that have been restored to static display or flying condition. On completion of reading this book, the reader will understand that the author is every bit as effective in telling the story of an aircraft and its pilots, as he has proved in writing about lifeboats. An ideal stocking present for Christmas that will be appreciated by a wide readership.